I have talked about this love triangle before, and i will mention it again here; the writers of Spider-Man at that time where working hard to show the tension between Betty and Liz (although perhaps more seen in Betty the then current Girlfriend of Peter Parker). This is also a tension that Parker is quite aware of, while having no idea how to deal with. To make matters worse, often what Parker does in ‘protecting’ his identity just leads to Betty Brants suspicions about him, and Liz, leaving this issue at a heart throbbing peak, in tears not to far from the end. But Betty is not wrong about Liz Allan’s intent, Liz shows us in this issue, the great lengths she is willing to go to try to win Peter Parkers heart, using flash and his Spider-Man fan club to try to draw Peter out to an event where she can have a good chance to get to know him better. She is also not shy about slinging slightly failed attacks at Betty, while trying to show off to Peter. This issue is not the first to reference Mary Jane, with Aunt May trying to hook peter up with ‘the Watson girl’ as far back as Amazing Spider-Man #15. In this issue, they successfully avoid meeting yet again; much to parkers desire; having no wish for anyone other than Betty Brant. This issue, in many ways is filled with repeats, leading to slightly different effect. Aunt May is again ill and taken to the hospital, much like in Amazing Spider-Man #9. 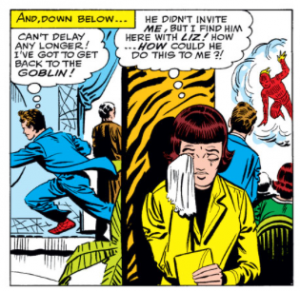 This in fact is the event that leads to the end of the issue, with Spider-Man overhearing a call about his aunt for Peter in the club; and runs off from the battle to be with his aunt. This adjustment of priorities in many ways is as key to Peter and Spider-Man as characters as is the heart attack to developing Aunt May herself. And thus the conflict is brought to an end prematurely and the issue is left with a cliffhanger greater than any comic battle. From the concept of Spider-Man’s fan club emulating the ideas we have seen in other books for other heroes (only this one using more of spider-man’s large cast or regulars), to drawing spider-man to an event with an ad (used just one issue before this) This issue, rather than being original is a creative reuse of existing parts, hooks and ideas both to reinforce the cast, the continuity but also to tell a creative story. In fact, I would say it is safe to say, that while the battle in this adventure is inconclusive, and most people are left with a lack of faith in Spider-man, I – standing with Flash Thompson – see this as a great example of our hero and heart. Showing us that, even heroes when faced with the kinds of family crisis that people face every day, acts the same way… putting family first. This is something, that while it may not seem all that heroic, is hardly something we can blame him for. Steve Ditko’s work in this issue was quite well done, offering good solid looks to the cast of characters, offering up several good uses of foreshortening, and having deep real feeling facial expressions, often aught between moments.